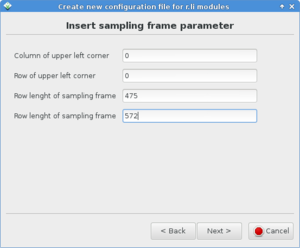 g.gui.rlisetup - Configuration tool for r.li modules. 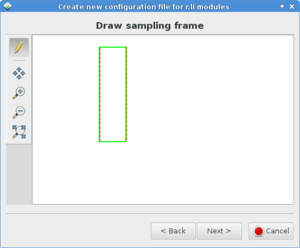 The g.gui.rlisetup is a wxGUI component which allows the user to create a configuration file for the analytical r.li modules. For a general introduction, see the r.li overview. The configurations are raster map independent, it means that you can use a file created on a raster map for analyze any other you have. 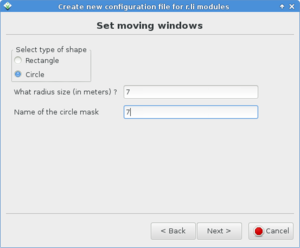 View/Edit (Load a file) from the shown list: the configuration is shown in a small text editor window. 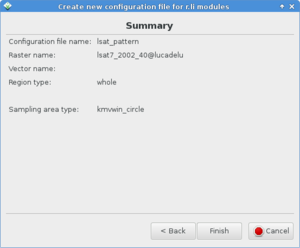 Configuration files are saved in the folder C:\Users\userxy\AppData\Roaming\GRASS7\r.li\ (MS-Windows) or $HOME/.r.li/ (GNU/Linux) (the file name can be defined by the user). The output or an analysis can either be a new raster map (in case of using a "moving window" analysis) or be an ASCII text file (when not performing a "moving window" analysis) containing the result. Such text file will be saved in the folder C:\Users\userxy\AppData\Roaming\GRASS7\r.li\output\ (MS-Windows) or $HOME/.grass7/r.li/output/ (GNU/Linux). All dimensions are percentages of raster rows or columns. Keyboard setting: the user enters the coordinates in cells of upper left corner of sampling frame and its length in rows and columns. Regions: the user enters the number of areas and then draws them using mouse. Sample units: they are areas of rectangular or circular shape. The user can define them using keyboard or mouse. Random non overlapping: the user specifies the number of sample units and they are placed in a random way at runtime. It is guaranteed that the areas do not intersect themselves. Systematic contiguous: the defined sample is placed covering the sample frame, side by side across rows. Systematic non contiguous: the same as above, but here ever rectangle is spaced from another by a specified number of cells. 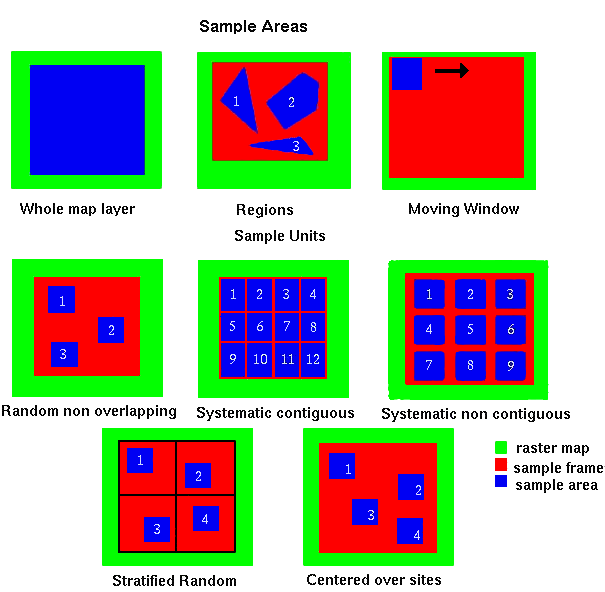 Stratified random: the sample frame is divided in n strats of rows and m strats of columns (n and m are given by user), then the specified number of sample areas are placed in a random way, one for every m*n areas defined by strats. Centered over sites: the sample areas are placed into sample frame centering them on points in site file. 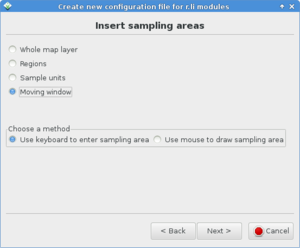 mouse: the user chooses the shape and then draws the specified number of sample areas on map. 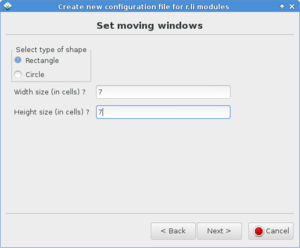 Moving Window: the user defines a rectangular or circular area, it is moved over all the raster increasing only of a cell for every move(in columns if possible, if not in rows). It produces a new raster containing the result of all analysis. Select areas from the overlaid vector map: the sample areas are defined by the vector map selected above. For every cat in vector map, the procedure prompts the user if they want to include it as sample area. 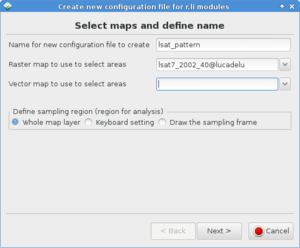 The resulting configuration file can be used only with the specified raster map, and the procedure can be used only if whole map layer is selected as sampling frame. Remove a file the selected file is deleted from the available configuration files. Help: open this help text. Configuration files are raster map independent because areas are saved using relative coordinates. Raster map name to use to select areas: "forests"
Define a sampling frame (region for analysis): "Whole map layer", then "OK"
Define sampling areas: "Moving window", then "OK"
Then click on "Use keyboard to define moving window dimension"
Width size (in cells)? : "7"
Height size (in cells)? : "7"
Now an anaysis can be performed using one of the analytical modules, e.g. The result is the new raster map "forests_p_dens7" which shows (in this example) the patch density of the forest areas. See the respective modules for further examples. Raster map name to use to select areas: "lsat7_2000_40"
Define sampling areas: "Whole map layer", then "OK"
The result is the new text file "forests_p_dens7" (stored in folder $HOME/.r.li/output/.